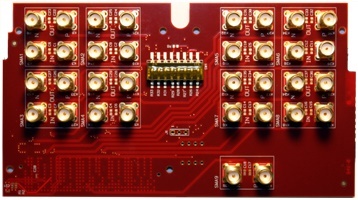 Powered by Xilinx Virtex-6 HX565Tor HX380T FPGA (with 40 GTX (6.6Gbps) & 24 GTH (11.13Gbps) serial transceivers), this optical network card provides access to eight lanes of PCI Express Gen 2 , four SFP+ connectors (40 Gbps), MoSys Bandwidth Engine® IC (576Mb Multibank 1T-SRAM with Serial 10G Interface and onboard ALU), up to 16 GB of DDR3 SO-DIMM, QDR II, ten 11.18 Gbps and ten 6.6Gbps serial ports. 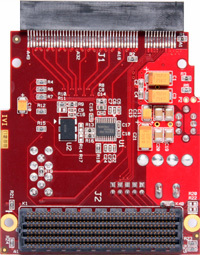 The on-board FPGA Mezzanine Connectors (FMC) along with off-the-shelf FMC modules, expend the functionality of the board for variety of different applications. Two SFP+ ports are powered by an external PHY chip (with Electrical Dispersion Compensation) supporting short range, medium range, and long range optical interfaces. 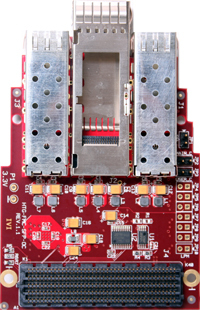 Two additional SFP+ ports are connected directly to the GTH transceivers of the on-board FPGA. 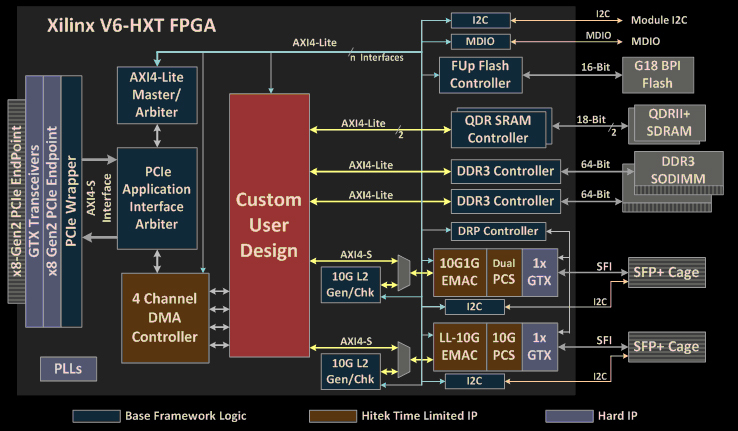 ▪ Size: 9.5" x 4.0"
Extensible FPGA Framework (EFW) provides a verified set of productivity solutions, including module targeted physical interface components, device drivers and APIs for the HTG-V6HXT-X16PCIE platform. The EFW enables end user to skip the tedious and time consuming phase of the platform's bring-up by providing targeted and hardware verified physical interfaces. Additionally, the framework allows users to simulate, integrate and test Ethernet and DMA cores (licensed separately) in their designs with time limited synthesizable binaries and simulation libraries. Following figure shows the elements and interfaces of the framework. The base framework provides all the design files, device drivers and API to access the memory mapped registers inside the FPGA. It enables an end user to instantiate and control custom logic blocks through the GUI application. Another key feature of the base EFW is the capability to program and erase the G18 BPI memory on the HTG-V6H-x8PCIE through the PCIe interface at very high speeds. Integrating the Field Upgradable controller allows any user design to be field upgradeable through PCIe. It can also eliminate the need for the USB platform cable during the design and development phase. 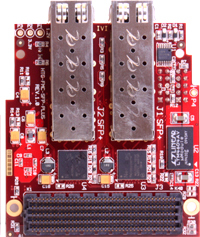 The base framework also provides the targeted (MIG generated) wrapper for the 1066Mbps (533MHz) DDR3 and 350MHz QDRII+ controllers. 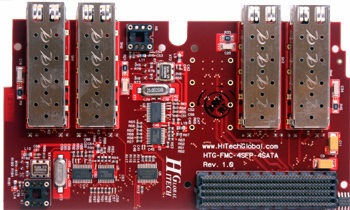 Memory mapped MDIO and I2C controllers are also integrated in the EFW to control and configure the PHYs and clock elements on HTG-V6H-x8PCIE module. EFW also serves as the evaluation platform for the 10G low latency and dual-mode 10G/1G Ethernet IP solutions. 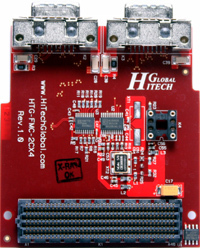 It allows the user to test the 1G and 10G Ethernet interface capabilities of the HTG-V6H-x8PCIE without any code development. User can then extend the Ethernet interfaces to user specific designs through the industry standard AXI4-Streaming interface. Full simulation libraries included in the EFW enables the user to simulate and test the Ethernet interfaces before licensing the solutions. 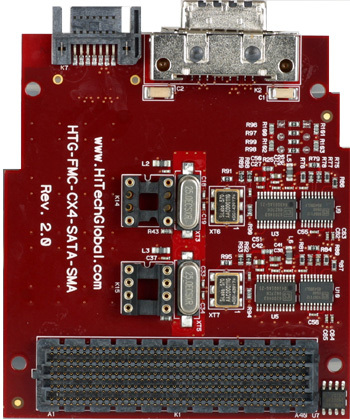 EFW’s integrated (time limited) 4-channel 128-bit data path (@ 250MHz) block DMA controller along with the PCIe device drivers allows the user to implement and verify high speed data and packet applications on the HTG-V6H-x8PCIE module. 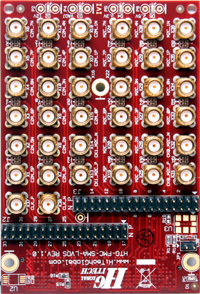 FMC daughter card with four SFP/SFP+ and four SATAI/II/III connectors.